Filed in Singles/EPs | Tags: Animal Collective, Domino Recording Co. Following the all-out pop effervescence of Strawberry Jam, Water Curses catches the band in a much reflective mood, their colourful songs stripped down, leaving vocals and melodies exposed. Three of the four tracks including on this EP were recorded during the Strawberry Jam sessions, but the mood is closer to the most contemplative moments of Feels or Sung Tongs. Water Curses, which opens, is perhaps the closest to the kaleidoscopic rhetoric of the album, especially in its mid section, but here, the guitars are more discreet, bubbling gently in the background, and the electronics, while still much present, only provide surface atmospherics, leaving Avey Tare’s vocals to jump around the hypnotic beat like a mountain torrent in spring. With Street Flash, Cobwebs and Seal Eyeing, Animal Collective drift further into peaceful mode, creating surprisingly tamed motifs over sparse arrangements. The former is almost entirely based on treated guitar and voice, with crowd noises populate the backdrop, stretching over nearly seven minutes of atmospheric pop. On Cobweb, the band rely primarily on light percussions to guide Tare’s vocals, with distorted guitars adding grit on the second half of the song. Of the four songs collected here, Seal Eyeing is the barest and curls around the desolate brushes of a lone piano. Animal Collective have got into the habit of following albums with EPs that offer a glimpse into a different side of the band, and Water Curses is no different. Collecting some of the most reflective songs the band have released, this EP may surprise by its peaceful settings, but the music is as vibrant and essential as ever. 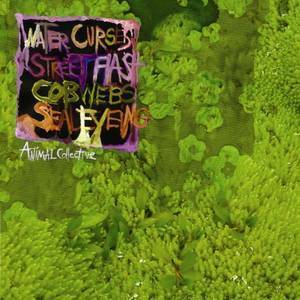 Animal Collective (MySpace) | Domino Recording Co.